I never thought I'd ever be a fan of rice pudding until I tried Rice to Riches in New York (a very long time ago). I didn't become a super fan, but I did think about it time to time while back in San Francisco. 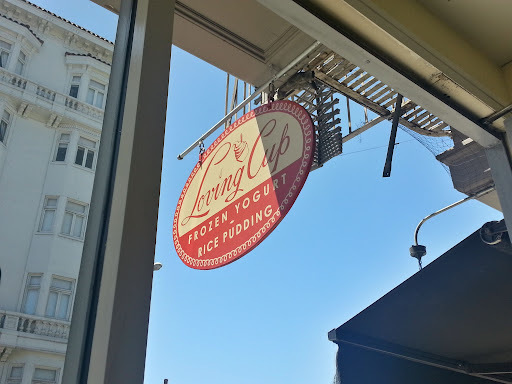 Loving Cup in Russian Hill apparently has been serving up rice pudding all this time! It doesn't have the funky decor or even the wide selection of flavors that Rice to Riches has, but its a decent substitute, especially since this is the first I've seen of flavored rice pudding in the city or even the Bay Area. 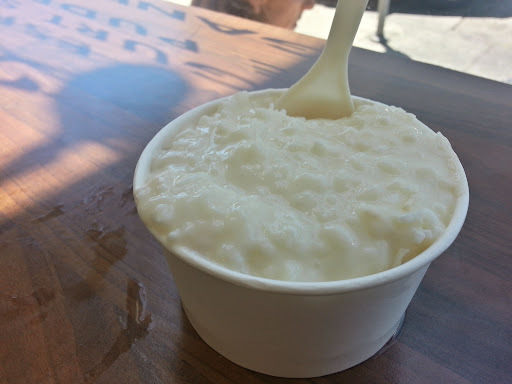 If you don't like rice pudding, they do make frozen yogurt a la Dairy Queen Blizzard style - meaning you pick a flavor and some toppings and they whirl it around for a special custom flavor combination. Loving Cup only has about 6 or so flavors so don't come expecting the Rice to Riches massive selection of funky flavors. I think the small cup is actually quite large and you can pick up to two flavors to fill the cup. One gripe is I hate how they scoop the pudding. They layer one on top of the other so to even taste the second flavor you have to dig deep. With most of the rice pudding flavors being white in color, you still don't really know what to expect as you spoon into the rice pudding. I prefer Rice to Riches method of halving the cup by piling the flavors on each side of the cup. 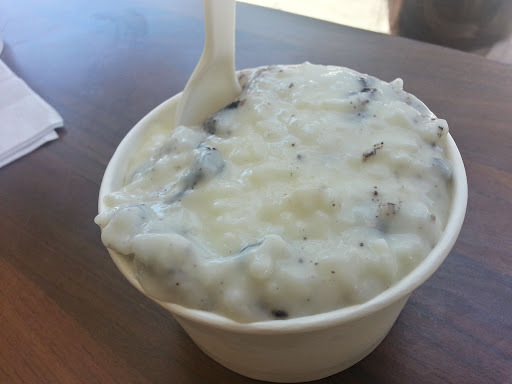 The cookies and cream flavor had bits of cookie pieces mixed into the rice pudding. This was probably the best of the four flavors. The Madagascar vanilla, which is somewhere mixed into this cup, was a little bland and didn't have that punch of vanilla taste that I associate with Madagascar vanilla. Another white gooey concoction, but really its toasted coconut piled on top of English toffee. Surprisingly the English toffee was not a standout at all. I could barely taste any type of toffee flavor. The toasted coconut, however, had shredded coconut to add more texture to the rice pudding. It was more of a subtle coconut flavor.